More than a calming exercise for mind and body, our classes teaching traditional T'ai Chi Ch'uan An ancient Chinese exercise system designed for health and self-defense and is literally translated as “Grand Ultimate Fist”. Also spelled Taiji Quan, it is considered one of the soft or internal arts combining meditation, Chi Kung (breathing exercises) and fighting techniques. will also help you learn the art of self-defense as it was practiced in China hundreds of years ago. From the moment you step inside, you'll find that Crooked River T'ai Chi Ch'uan Center is a beautiful and soothing facility that will provide you with the perfect environment to learn and practice the art of T'ai Chi Ch'uan. As seen in park settings all over the world, popular Yang-style A style of T’ai Chi Ch’uan named for Yang Lu-chan in the early 19th century. 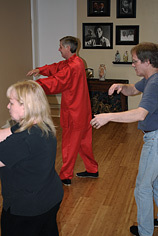 T'ai Chi Ch'uan is taught to students of all ages and abilities. Corporate Health and Wellness programs teaching T'ai Chi at Work are also available to local businesses to help employees manage stress and improve concentration. Whether you are learning T'ai Chi Ch'uan as a martial art for self-defense or using its gentle, flowing movements to lower blood pressure, increase flexibility, reduce stress, and improve your balance and coordination, our classes will bring confidence and satisfaction to your life. Classes are taught in a friendly, relaxed atmosphere where each student has the opportunity to learn and experience the basic principles and philosophies of T'ai Chi Ch'uan at their own pace. This is a two person exercise to learn rooting, balance, sensitivity, mind-body coordination and neutralization. A second generation student of Professor Cheng Man-ching (who is known as the Great Grandmaster of Yang-style T'ai Chi Ch'uan), Master Jim Holz began his training in T'ai Chi Ch'uan in 1982 and received his diploma to teach in 1995 from the internationally recognized Grandmaster William C.C. Chen of New York City. Regarded as one of the finest and most influential traditional internal stylist of his generation, William C.C. Chen was chosen "Man of the Year" for Inside Kung-Fu's first Hall of Fame of the Millennium. 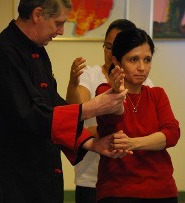 Continuing as a student of Grandmaster Chen to this day, Master Jim Holz is a passionate, thoughtful and skilled teacher who has taught the art of T'ai Chi Ch'uan on an international level with students in Germany, Holland, Portugal, Canada and here in the United States. Master will bring his light-hearted manner and many colorful stories to the classroom for an enjoyable experience that will leave you feeling energized and refreshed.